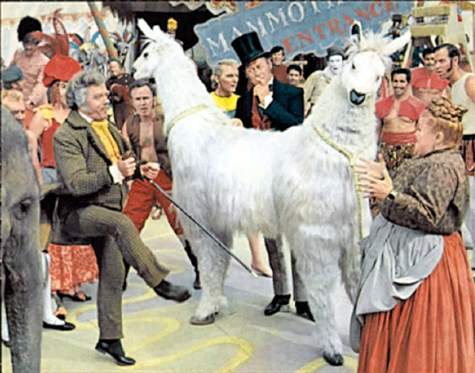 The first movie I was taken to see as a kid was DR DOLITTLE, the Cinemascope bloater coughed up by 20th Century Fox in an attempt to make a roadshow family picture which capitalized on Rex Harrison’s turn as a lovable misogynist in MY FAIR LADY. This is a history lesson. Firstly, I was born the year of the film’s release, and I don’t think my parents took me as a baby, so that tells you something — tattered, speckled prints of this gigantic flopperoo were still circulating tiredly in the provinces at least three years after the film died like an obese dog (looking up mournfully, tail wagging in a sluggish but heartbreakingly hopeful manner) at the box office. Film distribution was clearly a whole different thing in the early seventies. My parents report that my first response to a movie on the big screen was to start bawling. Nobody had told me it would be dark in the cinema. Now, I just half-watched the film (I wouldn’t attempt a proper review without whole-watching a film, but DR D does rather resist the full attention) with the intent of checking to see if I remember anything about it. There was one image in my head, divorced from any of the glimpses of the film I’ve caught on TV over the years, and from the bits everybody knows are in it, like Harrison speak-singing “If I Could Talk to the Animals.” I had an image of a ship, or possibly a raft, on a stormy sea at night. But for some reason I had a doubt that the image might have come from Altman’s POPEYE, another family film that flopped, released much much later, which I also saw at the cinema. The image is there! 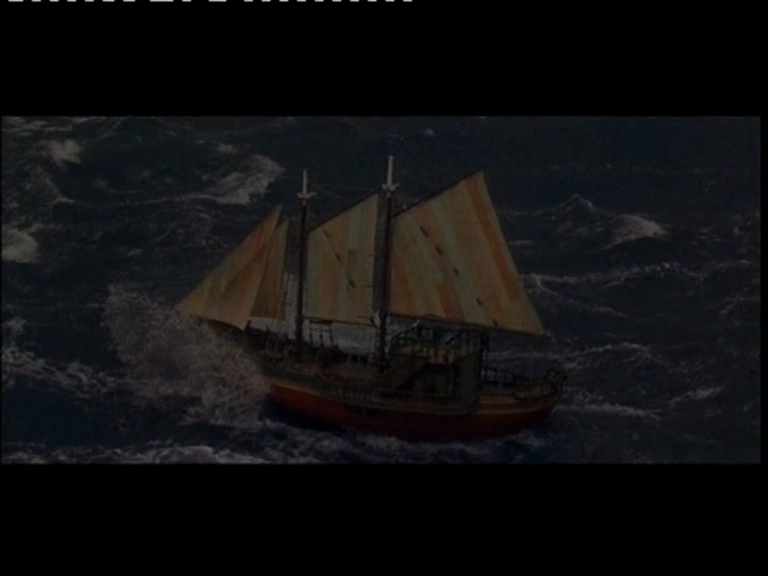 It’s a couple of hours into the film (which is purportedly about a voyage but takes that long to get properly under sail). 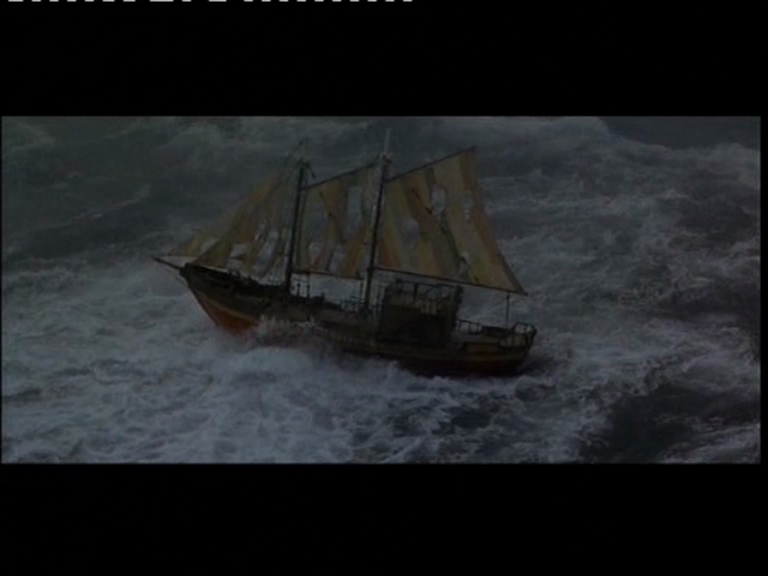 The ship gets wrecked and then the characters are on rafts. “I told you Flounder was a terrible name for a ship.” Whereas Robin Williams in POPEYE begins the film on a raft, at sea, at night in a storm. I suddenly flashed on the possibility that my parents had turned up in the middle of the film. We did that sometimes in those days. 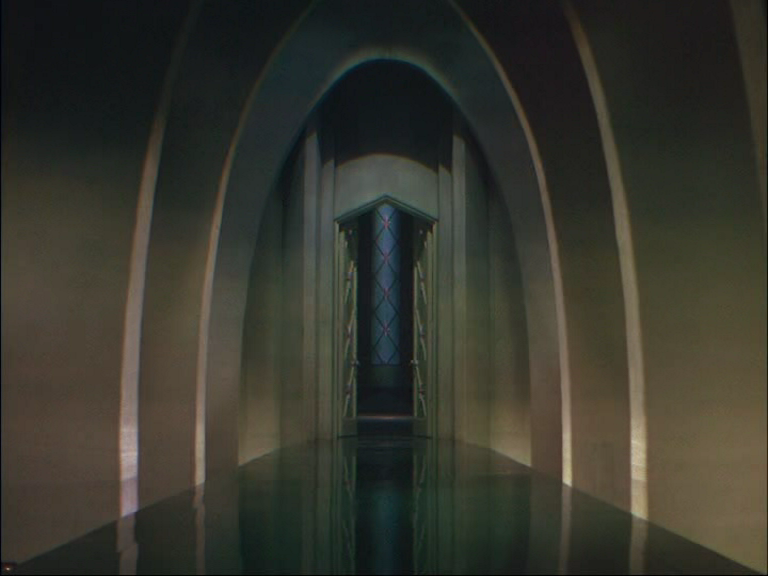 I certainly remember double features where we entered midway through the B-picture. Yes, there were films running in repertory then, and double bills (Roger Moore as Bond, Godzilla versus whoever was around, HERBIE VS CHRISTINE) and people still sometimes turned up without consulting the listings and went to see whatever was on, regardless of whether it had started. Alfred Hitchcock tried to wipe out this deleterious practice by banning late entrants to PSYCHO, but it didn’t completely stop careless punters from turning every film into a non-linear adventure in piecemeal narrative composition. So I suspect I was a distressed three-year-old because I was dragged into a giant dark auditorium in the middle of a scary sea-storm at night. Dark in the cinema and dark onscreen. Maybe an usherette with a torch to add further nocturnal drama and hushed urgency, maybe not. Maybe not, maybe we entered during the ads or trailers like civilized people, I don’t know. I think I was repelled by the pushme-pullyou, also. Say what you like, it’s not natural. On my recent New York jaunt, Guy Budziak kindly presented me with a collected set of Fleischer POPEYE cartoons, stuffed with extras. Since we’re teen-sitting this week, I thought I’d experiment upon Louis, our young charge, to see whether 1930s animation still pleases the youth of today. “He’s hijacked a whale!” exclaimed Louis. Popeye steers his cetacean ride into harbour, and it converts into a nifty staircase to get him onto the pier. Been reading Vol.3 of the collected Popeye, which is fantastic stuff. Reputation had it that this is the point where E.C. 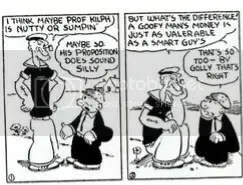 Segar’s newspaper strip really hit the heights, but I wouldn’t quite agree — for me, the stuff really started to work on me partway through voulme 1, and since then everything I’ve read of Popeye, Olive Oyle, Castor Oyle and Wimpy’s adventures has been simply terrific. I particularly enjoy the evolving portrayal of depression-era slang — the phrases used by the characters go through distinct phases, reflecting either the lingo of the day, or Segar’s exposure to it. Partway through volume 1, the word “punk” took hold: “This is a punk country,” “You punk wife!” etc. The exclamation “Good night!” an expression of alarm or dismay, was popular from day one, but has become less common recently. The dismissive “Ah, be yourself!” just made it’s first appearance in Vol. 3, and looks set to be around awhile. Meanwhile, I also picked up The Mammoth Book of Best Crime Comics (unwieldy title!) edited by Paul Gravett, which reproduces a chunk of Secret Agent X-9, a detective yarn illustrated by Alex Raymond (before he created Flash Gordon, I think) and written by Dashiell Hammett. Fun stuff (although the pages are printed out of order in my library edition). Initially, the shock is how clunkily written it is, considering it’s Hammett. Some of the dialogue is pithy and slangy, but a lot of it is comically bald exposition. The plotting is helter-skelter and action-packed, following the traditional pulp dictum that if you get stuck, have a man come through the door with a gun. The second shock is how good it is regardless of the sloppiness. Hammett must have been writing fast, and probably without a game plan. But his convoluted scenario is suspenseful and engaging, some of his characters are very winning (there’s a good vamp, and a verbose fat man somewhat in the Greenstreet vein), and there are occasional bon mots: “This is jolly!” remarks X-9 sourly, while balancing on a plank between two tall buildings, one of which is one fire, supporting two falling persons (the accident-prone heroine and her insane father) and being shot at by an army of gangsters disguised as cops. Also, it appealed to me that the gang boss X-9 is trailing is known as “the Top”. I’m thinking of getting the movie serial version of this, in hopes that it might have the same naive charm and frenetic brio.